Applications are now open to all U-M graduate programs for 2019–20 Rackham Faculty Allies and Student Ally Diversity Grants. Developed to fund initiatives that help all graduate students—including those from groups underrepresented in higher education—to feel welcome and thrive in their studies at the University of Michigan, the Faculty Allies and Student Ally Diversity Grants aim to enhance diversity, equity, and inclusion (DEI) efforts within graduate programs across the U-M campus. They are open to faculty in Rackham and non-Rackham programs. 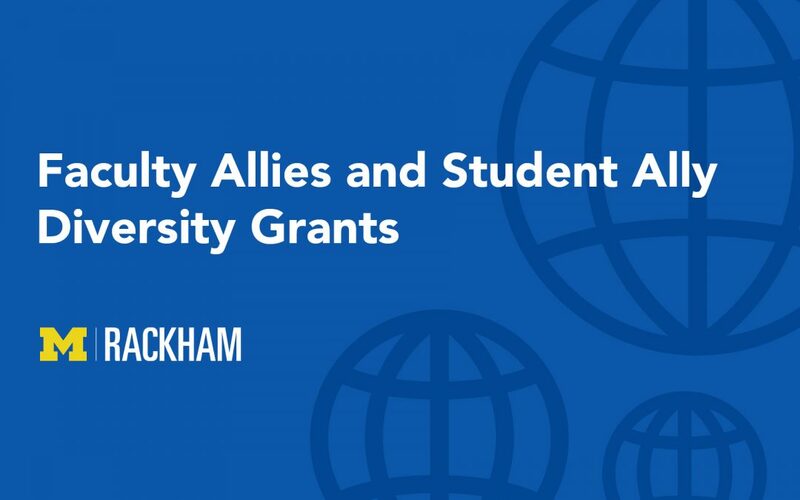 The Faculty Allies Diversity Grant awards up to $12,000 for initiatives to improve program climates, aid student retention and completion, provide opportunities for academic and professional development, boost career outcomes and success for graduate students, and encourage engagement between students and alumni. This year, Rackham is also offering a small number of initial grants up to $20,000 to support highly creative, ambitious proposals. These proposals could include cross-department collaborations; the organization of major conferences for students, faculty, and alumni; or writing boot camps for faculty and students. Applicants can also submit a proposal for a Student Ally Diversity Grant, which awards up to $5,000 to pay graduate students to work closely with a Faculty Ally on initiatives and projects under the Faculty Allies Diversity Grant. In an effort to build long-term, sustainable DEI initiatives throughout the university, the grants are intended as seed money for faculty allies and their programs, and are renewable for up to four years. This approach is meant to give departments needed resources to start DEI programs and give them ample time to find means of making them self-sustaining. The Faculty Diversity Allies Grant recently allowed EECS to invite Cornell professor Nicki Dell to speak to students on her research, which focuses on helping health care workers in India and combating the rising role of social media and spyware in domestic violence in New York City. Dell was also able to spend hours meeting with students in small groups about how to prepare for their careers. “The combination of funding support allows us to attract top-tier talent to speak to U-M students,” Weimer said. The grants form an important piece of one of Rackham Graduate School’s core missions—supporting faculty-led activities to strengthen diversity in graduate programs and departments. Applications are due February 28, 2019. To apply or find further information, please visit the Rackham website.